We had a couple of amazing projects entered to our March Challenge. YOU all our followers inspire us so much! We love to see those gorgeous entries to our challenges from ALL around the globe. That is one of our biggest goals with our challenges is to reach crafters all over the world. As always picking a winner was hard – but the Creative Crew came to a conclusion – the winner of the challenge is Natassa (Anastasia) Blazaki! Natassa made this fantastic art journal spread that really took up on the elements in the Moodboard and will be invited to be our Guest Designer in May! 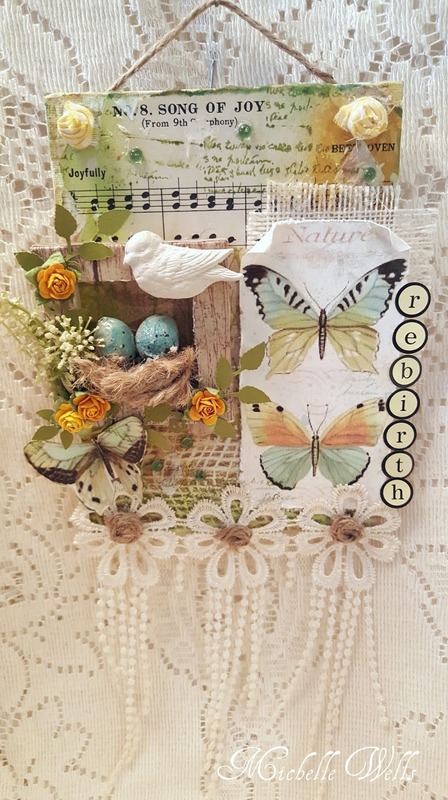 Michelle Wells from USA made this beautiful wall hanging. This striking canvas vas made by Hega in Norway. Merkku in Finland made this stunning home decor piece. Ladies – congratulations to the feature – please display this badge on your blog. We hope that you have been inspired to create something and participate in our “Feathers” challenge and you can find all about it here. You have until May 5 to upload your entry! Thank you so much for the honour! I am so grateful! Congratulations to all the contestants for their beautiful projects!